What could be wrong with rewarding people for voting, maybe with a free coffee or French fries or a slice of pizza? Plenty of restaurants offer deals around Election Day (which is tomorrow, but you already knew that because you are a smart, informed citizen who wouldn’t dream of not doing their civic duty), but Nation’s Restaurant News explains that, unfortunately, many of those promotions are probably illegal. That’s because a federal law “prohibits anyone who knowingly or willfully pays or offers to pay, or accepts payment, for registering people to vote or for voting,” according to NRN. 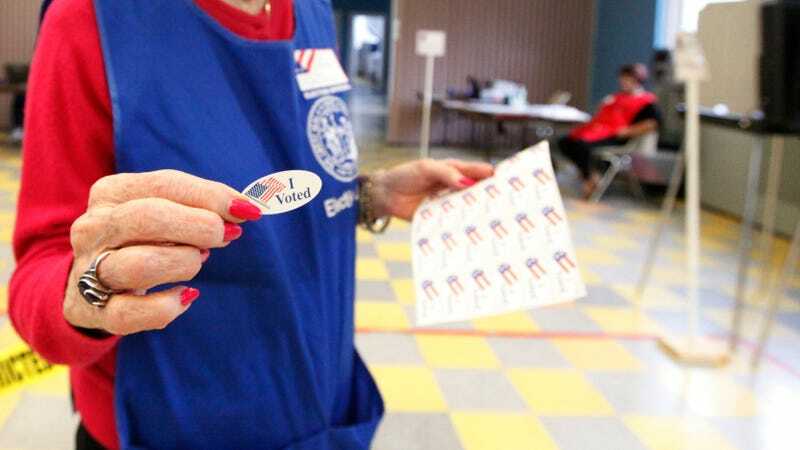 The rule is on the books to prevent people or businesses from attempting to sway voters or influence their choices, and it means that what seems like a harmless “get a free smoothie by showing your ‘I Voted’ sticker” deal isn’t kosher. Courts have ruled that even discounts or free food—not just cash incentives—fall under this law. Chicago’s The Field Museum is just one example of a business that changed its Election Day promotion once it was informed of the law. The museum had intended to offer free admission tomorrow for those displaying proof of voting, but after realizing this was illegal, the museum changed the deal to offer free admission to all Illinois residents on November 6, RedEye Chicago reports. Restaurants and businesses around the country will likely still offer Election Day promotions, free food, and discounts, as they’re either unaware of their illegality or just don’t expect to busted for it. If authorities did decide to crack down on them, though, San Francisco-based lawyer Anita Stearns Mayo tells NRN the business owner could face a $10,000 fine or up to five years in prison, or both.